Louis Vuitton is moving forward. After having Marc Jacobs replaced by French designer Nicolas Ghesquiere (formerly at Balenciaga) as the artistic director for women ready-to-wear collections, LVMH will open the Louis Vuitton Foundation. And of course, the architect of the building is none other than Frank Gehry, the architect of the celebrated Guggenheim Museum in Bilbao. 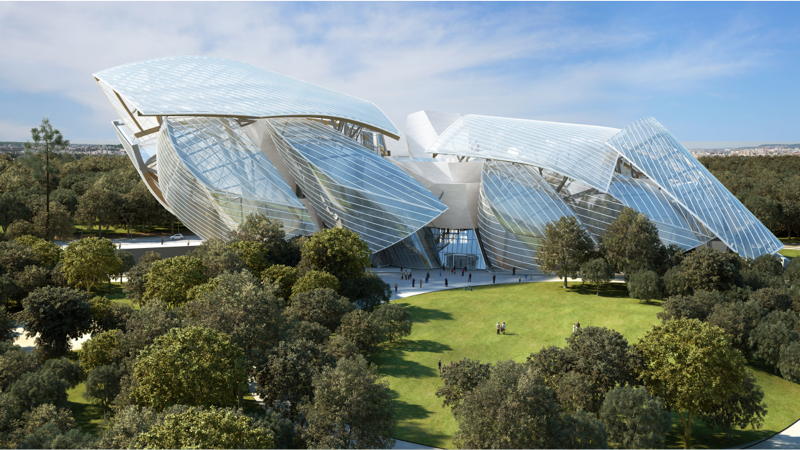 The Fondation Louis Vuitton will open in Paris on October, 27 and house contemporary art collections. With its twelve immense glass sails, this extraordinary building, designed by Frank Gehry, looks like a futuristic vessel amongst the trees of the Bois de Boulogne. It perfectly embodies the project of the Fondation: being unique, creative and innovative. And the successful collaboration continued! This year, six iconoclastic schemes pay tribute to the classic Louis Vuitton “toile Monogram” (Monogram fabric). Among the designers: Christian Louboutin, Karl Lagerfeld and… Frank Gehry! He applied his avant-garde style to a bag: the “Twisted Box” joining the well-known Monogram of the brand and this aesthetic of his. For the window displays of the Fall/Winter collection, Gehry created metallic panels that twist and swirl around the pieces. The “Wind Wings”, as Gehry calls them, are directly inspired from the shell-shaped roof of the Foundation.